They’re co-workers and friends but maybe it’s time to become more than friends. Okay, that was a cheesy play on the title but the title pretty well sums up the premise of the book. Tim and Scott work together and Scott just happens to be the younger brother of Tim’s best friend. It’s a common trope of a bro-code coming in between a potential love affair. There’re several different directions the story can go, I wanted to see how Ms. Starr would handle it. Tim and Scott are both likable characters. The chemistry sizzled in the prolonged glances. The buildup is slow. Painfully so in some spots. There was opportunity to show rather than tell. Having said that, the author is very talented in describing the scene, I could see it, I was there but that didn’t always move the story along. This is a short story and I knew going in that there might be some conflict with Tim and his friend Paul when it came out that Tim was interested in his younger brother. I wanted to get to the point where Tim and Scott admit to their mutual attraction. I just knew that if the way the author described their chemistry was as vivid as he made the describing the scenery, it was going to be hot! She didn’t disappoint. The ending is good. 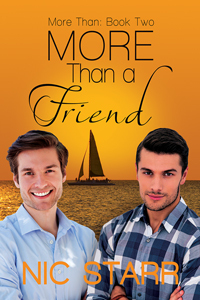 The author handled it well and I walked away satisfied with their HEA. Readers who enjoy lots of details and some sweet chemistry with hot sheet action should give this one a try.